Oasis Chiropractic Center takes great pride in providing the finest state-of-the-art care for our patients. We specialize in the finest chiropractic and wellness care available. We offer a variety of services geared to optimizing your health. Below is a sampling of the different chiropractic services we offer in our Brickell office. Depending on your needs and health goals, different techniques and/ or modalities will be utilized. Chiropractic Adjustments help balance your structure, decrease stress on nerves, and improve function. Alignment and optimum biomechanics of your skeletal system is essential for movement and full expression of life. Life is motion! Several different techniques are utilized, all gentle, safe, and effective. Click here for more information about techniques. We use Acupuncture on 50% of our patients. Acupuncture helps increase the body’s own healing mechanisms. Some effects of acupuncture include pain relief, increased circulation, insomnia relief, improved immune system functioning, reduction of muscle spasms, increased range of motion in joints, stress reduction, relaxation, and improved sense of well-being. To find out more about Acupuncture at Oasis Chiropractic Center click here. An important part of the wellness services we offer, and an important supplement to our chiropractic care, is Deep Tissue Massage Therapy. Our office provides specific massage and muscular therapy that is tailored to meet each patient’s condition or special needs. We have a caring, experienced and licensed massage therapist on staff at our Brickell office. Massage appointments are available by appointment only. We offer ½ hour massages and full hour massages. Click here for more information about Massage Therapy. Cerebral spinal fluid bathes, protects and nurtures your brain and spinal cord. Sometimes stress causes restrictions in the skull, spine and pelvis that affects the natural flow of this fluid. This results in improper nerve function that can lead to a variety of health concerns. CranioSacral Therapy (CST) is an effective way to release these restrictions, causing profound healing effects on physical and emotional levels. Click here for more information about CranioSacral Therapy. This creative visualization and relaxation system can get you there. In just 20-30 relaxing minutes a day you can reverse the damaging effects of stress while reducing or eliminating anxiety and worry. In fact, regular use of BrainSpa is proven to stimulate healthy brain chemistry, helping you to gain more energy, lose excess weight, introduce new positive behaviors, improve your immune system ,get rid of bad habits, and improve the overall quality of your life. To find out more about BrainSpa at Oasis Chiropractic Center click here. The future of energy medicine is here now! Pain relief, decreased inflammation, and calming your nerve system are just some of the results you can expect from PEMF therapy. The Pulsed Harmonix, creates a safe and gentle pulsed magnetic field that re-energizes and detoxifies your cells- allowing healing to happen. PEMF therapy has been widely researched and proven to be effective for many conditions. To find out more about PEMF at Oasis Chiropractic Center click here. Microcurrent Point Stimulation (MPS) is an effective, non-invasive and natural pain relief therapy that is changing the way people treat their pain. The Dolphin Neurostim device uses concentrated micro-current impulses to treat specific points that naturally reduce nervous system STRESS and cortisol, relaxing muscle tone and releasing the body’s natural pain killers, endorphins. It also accelerates cellular healing, treats chronic pain and can even improve mobility, reduce complications and decrease pain often associated with scars using the Scar Release Therapy. To find out more about MPS at Oasis Chiropractic Center click here. Laser Therapy also known as LLLT (Low level laser therapy) Light Therapy or Cold Laser is a painless, sterile, non-invasive, drug-free, FDA approved treatment which is used to treat a variety of pain syndromes, injuries, wounds, fractures, neurological conditions and pathologies. Laser therapy can be used any time a patient requests or needs a drug-less procedure for the control of pain, when conventional therapies have been ineffective, or when the acceleration of healing from in-juries is desired. It is safe, effective, and treatments only take a few minutes. Magnetic Acupuncture utilizes Acupuncture theory and points without the use of needles! This type of non-invasive healing treatment is ideal for patients who are sensitive to needles. The purpose of magnetic acupuncture treatment is to balance the meridian system by unblocking the obstruction in the channel. We will use our state of the art AcuGraph Digital Meridian Imaging system to analyze and document the energetic status of the acupuncture meridians, so that we are able to accurately analyze where Qi has become blocked or imbalanced. Click here to learn more about Kinesio Taping – FAQs. Even the smallest auto accident can create real problems. Whiplash injuries need to be taken very seriously; symptoms of a whiplash injury can take weeks or months to manifest, it is easy to be fooled into thinking that you are not as injured as you really are. Most medical doctors give pain killers to hide these injuries. The chiropractic approach to these types of injuries is to use specific chiropractic adjustments and various modalities to help return spinal function. Your injury treatment will determine how well you recover and your continued quality of life after your accident. By promptly determining the extent of your injuries, we can create a customized treatment program for a speedy recovery – and help you avoid a lifetime of chronic back pain and neck pain. Contact our office today, don’t let car accident injuries such as neck pain, back pain, whiplash, headaches and migraines keep you from your everyday life; let our experienced team get you on the road to recovery. Chiropractors don’t simply assess the feet alone, but have the ability to take into consideration all the weight – bearing structures of the body from the neck down to the feet in order prescribe the appropriate type of orthotic for you. The orthotics at Oasis Chiropractic Center are created using the latest computer technology and /or a unique casting technique that utilizes a certain density of foam and a sequence of semi-weight-bearing impressions, to ensure your orthotics fit and support you perfectly. Dr. Starkman is a certified Sole Supports provider with many years of professional experience in “Dynamic Casting”. If you would like more information about orthotics and/or other related products please click here. Auriculotherapy is safe, effective micro-current stimulation of nerve endings on the outer ears to help balance and or normalize a range of physiological and psychological functions. Auriculotherapy is often confused with ear acupuncture but it uses no absolutely no needles, and instead of “meridians” uses nerve connections. A micro-current stimulator is placed on reflex points on the outside of the ear. These points send a message to the brain based on the location of the reflex point being treated. Most people feel only a tiny tingling at the ear reflex points during treatment. Here at Oasis Chiropractic Center we perform auriculotherapy for Pain Management, Weight Loss, Stress Reduction, Headaches and Smoking Cessation, just to name a few. We have a highly trained and certified team specializing in this health care field. Massage therapy during pregnancy is a wonderful complementary choice for prenatal care. Prenatal Massage is a healthy way to support the physiologic, structural, and emotional well-being of both the expectant mother and baby. It also helps mom adjust to the changes brought about by the formation of a new body shape to make room for the growing fetus. There are many prenatal massage benefits that make it worthwhile to get on a scheduled massage plan during your pregnancy. For more information about prenatal massage click here. Chiropractic cares for mothers in all stages of pregnancy from pre-conception to post-partum. Regular Prenatal Chiropractic Care is essential, it helps keep mom feeling good and assist her in coping with the physical stresses of an ever changing body. Check out the benefits of receiving chiropractic care during and after your pregnancy. Learn more about chiropractic and pregnancy by clicking here. More and more parents are taking there children to receive Pediatric Chiropractic treatments, and you’re probably wondering why? We’ll here are just 10 reasons to name a few. To maximize their child’s brain and nerve development. To enhance their child’s overall health and wellbeing. To strengthen their child’s immunity and reduce the occurrence of colds, ear-aches and common illness. To help with colic and Irritable Baby Syndrome. To help with asthma, breathing difficulties and allergies. To improve spinal posture and balance. To improve their child’s ability to concentrate. To assist with behavioral disorders and improve emotional wellbeing. To help alleviate numerous digestive problems. To aid with bed-wetting and sleep disturbances. To learn more about Chiropractic and Children click here. Regular acupuncture during pregnancy sets the foundation for a healthy mom and baby. In addition, women who receive acupuncture during pregnancy often report having a shorter and easier birth experience than women who don’t. Several European studies concluded that women who received acupuncture once a week during the last month of pregnancy had significantly shorter labor than women who did not receive any acupuncture. To learn more about Prenatal Acupuncture click here. With a properly functioning nerve system, it is important to make sure you are getting the correct nutrition needed to have optimum health. Eating good, wholesome foods is essential, but not enough. If you are not properly digesting food thoroughly, absorbing the nutrients and eliminating wastes- poor health and symptoms such as acid reflux, IBS, constipation, allergies, and Fibromyalgia, among others, may result. The Loomis Enzyme Replacement System is designed to determine which foods are right for you, along with which enzymes are needed to decrease stress, and restore homeostasis (balance) and normal function. Click here for more information about Nutritional Counseling. Detox, which is short for detoxification, is the elimination of potentially toxic substances from your body. Although detoxification is primarily thought of as a treatment for alcohol or drug dependence, it is also a term used in alternative medicine to refer to diets, herbs, and other methods of removing dietary and environmental toxins from the body to restore health. •Identify which toxins are at the root of your health problems. •Remove toxins by cleansing your body. Diets do not work. The problem is not losing weight it is keeping it off. It is unrealistic to think you will be on a diet forever. You have to learn how to eat right and make lifestyle changes to benefit your health. Weight loss is a side effect of Detox, better health is the goal. To find out more about our Detox & Dieting program click here. Give your Employees the motivation they need to get & stay healthy! Oasis Chiropractic Center offers Corporate Wellness Programs that promote healthy living through Chiropractic, Nutrition, and Stress Management. All Corporate Wellness Programs are not created equal. Oasis Chiropractic holistic approach to Wellness Programs ensures each employee has the tools and resources necessary to achieve their personal health and wellness goals. Let’s face it, your employees could be healthier; we could all be healthier. 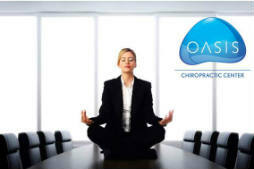 To find out more information about Oasis Chiropractic Wellness Programs CLICK HERE. Give our Miami chiropractic office a call to schedule an appointment today!